I have been pondering the word ‘Beauty’ this week. What is it? I had a lesson this week. I know someone who I have always believed is very beautiful. I saw a photo of her and was shocked as she looked very plain. Then it hit me beauty comes from the soul, it shines from the eyes, personality is intertwined with it. Photos sometimes catch it, but it depends on the skill of the photographer. But then I thought every photo of a child I have seen is always beautiful, even when they are cross eyed and angry! So a there is a certain element of our selves determines beauty. I love children so ergo all children are beautiful. There is no set formula for beauty. All I can say is the old maxim of beauty is in the eye of the beholder, we all are beautiful in different ways and to different people. Yeah I know, I am being a bit heavy here, but it is what has been in my head this week. So my task this week was to create a journal page of a beautiful girl, the girl that resides in all of us! Every day I pick a rose from my garden and have it on the kitchen bench, when I come out to the kitchen every morning I am greeted by a wonderful scent and great beauty. The above is today’s beauty, and it is really those colours, and the scent is very heady. I am linking up with all the wonderful creative artists at Paint Party Friday hosted by Eva and Kirstin as always. Have a great and beautiful week. Happy PPF Sharon! Beautiful ... love that painting and love that rose too! beautiful quote and painting! And that rose is gorgeous. Nice post today. Oh I agree about children...I love them so they are all beautiful. Some shine with individuality too... Young people are always so gorgeous...sadly they never know it. But yes people I may find gorgeous others don't. I am an inside out kind of gal...I find beauty from the inside out! That rose is clearly absolutely Gorgeous!! As is your soul and journal page! Your painting of the beautiful girl is just that - beautiful. She has a little of the look of Andie McDowall and you can see the person inside shining from her eyes. How lovely to be able to pick a rose every day, and such a gorgeous rose. Great photograph. I enjoyed your musings on beauty, and your journal page is great! a beautiful and happy portrait! Having a sweet rose in your kitchen every day can't help but make one stop for a moment and just take it in. Happy PPF! Hi Sharon. Happy PPF. You know how much I like your art. 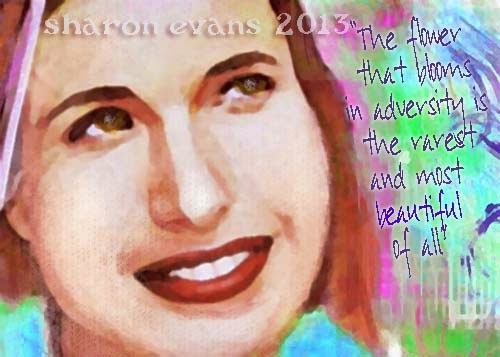 Gorgeous art Sharon..how I love this dazzling girl..wonderfully written..well said! I think beauty shine from within too! 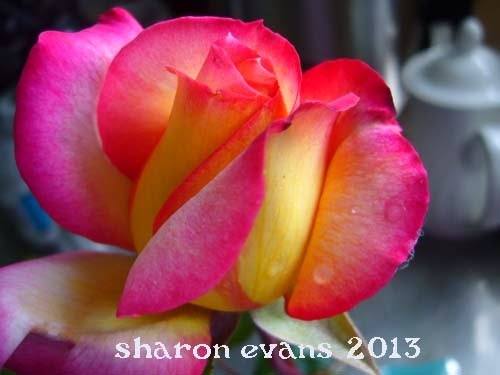 I love your rose..what an incredible bloom..it has pink and some yellow- apricot colors..how magical! Enjoy ! She really is a beauty Sharon, love her! And I totally agree with you about beauty .... That rose is unbelievable .... Those colours ..... Perfect! Beautiful work Sharon and a gorgeous rose too! So much beauty here! Your painting is beautiful - I have been painting a lot of faces recently and I have thought about human beauty a lot. I think that God's wonderful architectural work is seen in every face and that makes them beautiful. But I agree that beauty is a package deal - it's the whole person not the perfection of their features. By the way - wonderful job on the teeth - they are very difficult to do and you did a great job. Beautiful painting, lovely smile and eyes! Beauty is in the eye of the beholder, and you certainly captured it. Blessings, my friend! Hello dear lady...I miss you...hope all is well!! Just want you to know I care!